Here is the second half of the post, which includes more film text with accompanying caps, and the 4th entry in jan-u-wine's Lórien Suite. Written from Galadriel's point of view, it allows the reader deeply and thoughtfully into her experience of the encounter in the Glade. Also featured are seven screencaps by Blossom. 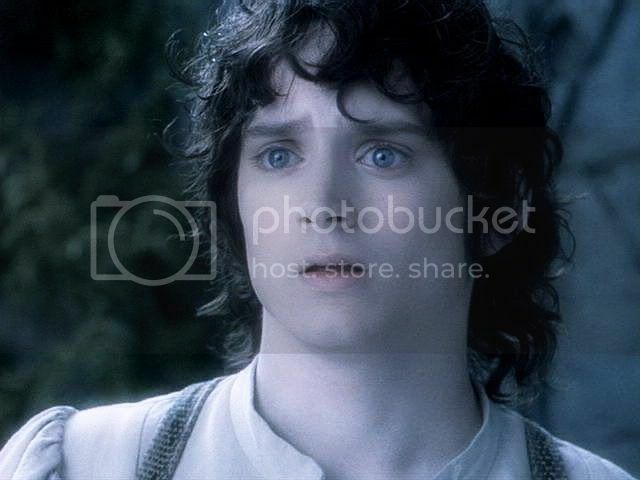 If you don't know her work from her gorgeous Frodo website, In Dreams, Blossom's screencaps are like no others. Each is a jewel, a little work of art. The caps below are from the EE edition of FOTR (in widescreen); mine, as usual, come from the theatrical version in fullscreen format. 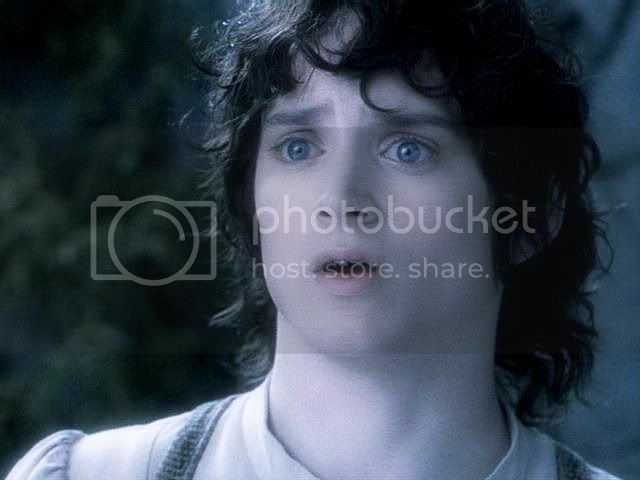 Galadriel: I pass the test. 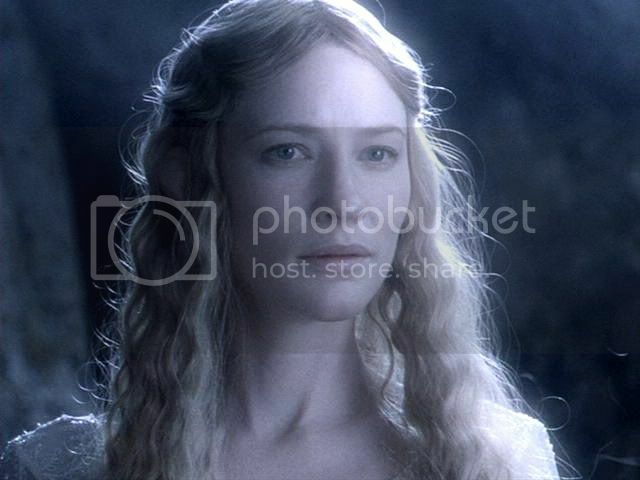 I will diminish, and go into the West, and remain Galadriel. 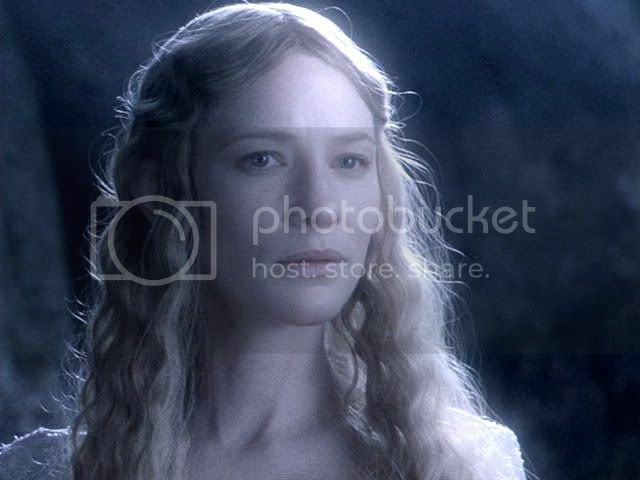 Galadriel: This is Nenya, the Ring of Adamant. And I am its keeper. 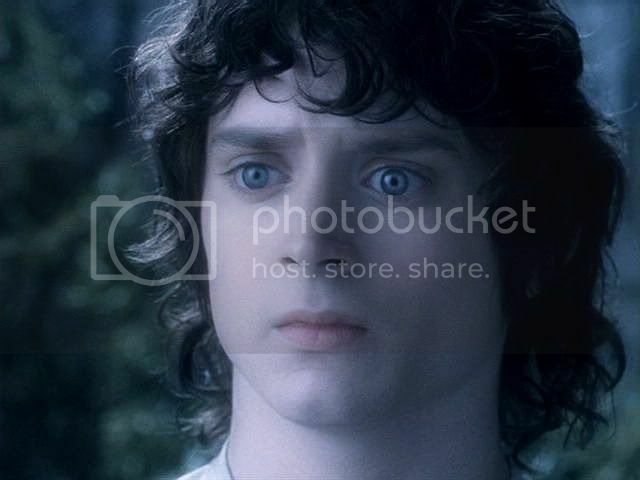 Galadriel: This task was appointed to you, and if you do not find a way, no one will. 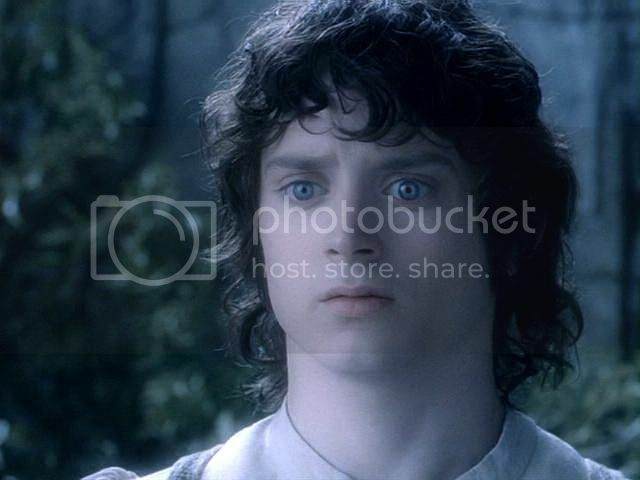 Frodo: Then I know what I must do. I am of the Eldar. would dim before my Light. I shall not then be diminished. I think you will see that her choice diminished her not at all, but rendered her *simply* and purely a complete being of beauty, NOT 'terrible' beauty. *in order to work around events that the movies placed out of context with the books (and also to include a work of wondrous value and beauty), I have done some event flipping myself. 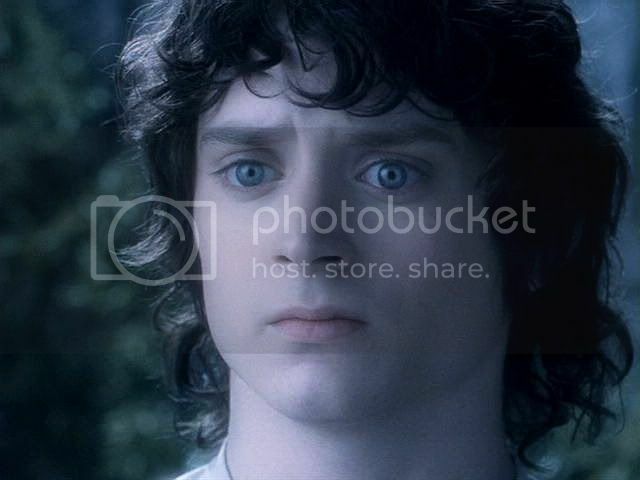 In the book, Galadriel, upon the departure of the Fellowship from Lorien, and knowing that it was unlikely that Frodo would escape permanent damage from bearing the Ring, expresses, in song, her wish that he might find peace in Valimar (a city of the Valar in Valinor). I have 'flipped' that time line to the Mirror scene, her perceiving that, should he win through, not only would she have the choice to go over Sea, but Frodo, as well. 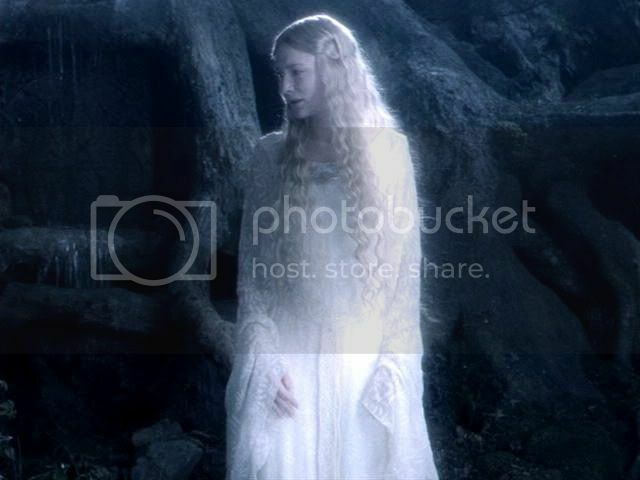 Here is a wonderful reading of "Galadriel's Lament" by Tolkien. You may not understand the words, but he reads them with so much power and feeling that your heart will *hear* them easily. 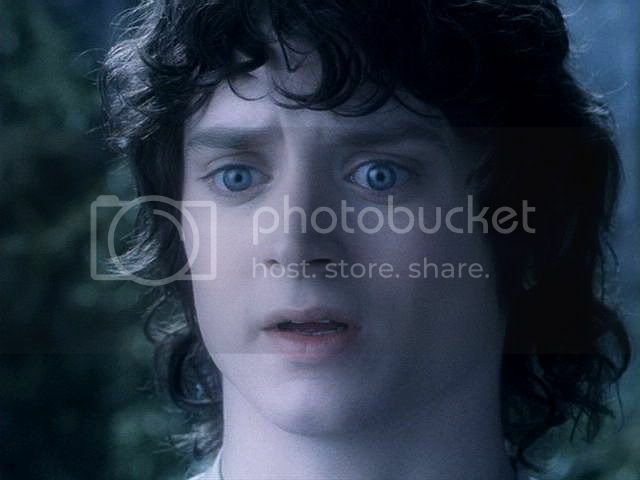 It is rumoured that Galadriel was instrumental in the healing of Frodo, over Sea. No doubt the reason behind the knowing smile she gave him at the Grey Havens. BACK to Galadriel's Glade Pt. 4a. FORWARD to Galadriel's Glade Pt. 5. ~ Mechtild's LJ entry introducing Blossom's 'In Dreams' site. 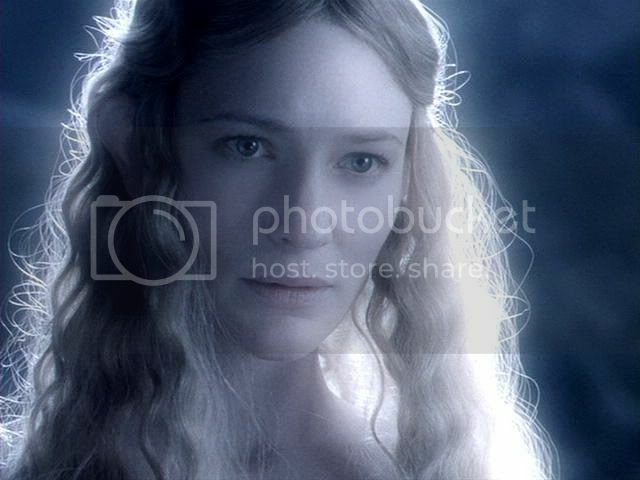 I love it that she has allowed Tolkien's Galadriel, whose character I think was wronged here by the filmmakers, to emerge from the images in a way she can't when the scene is playing. More lovely screencaps, and thank you for including some of mine here, Mechtild. 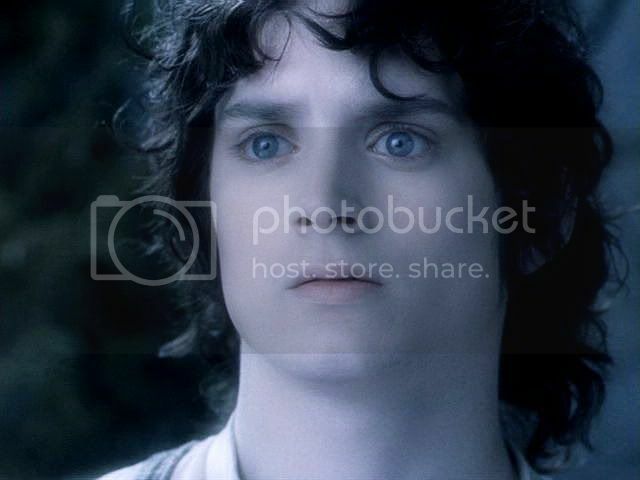 I often wish I had the films in fullscreen too, as I love your screencaps. 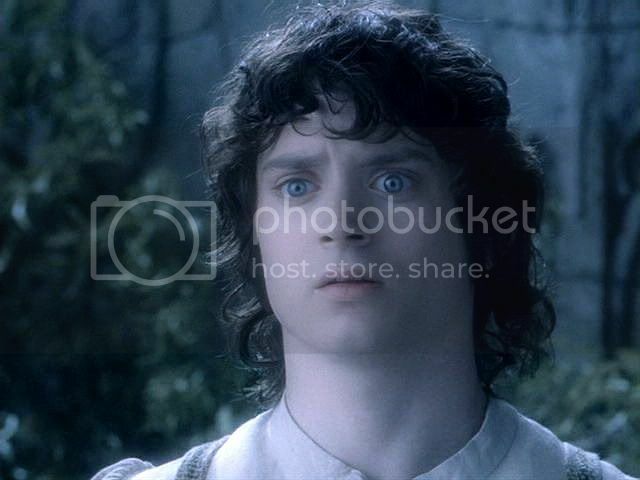 The fullscreen are especially good for close-ups of Frodo. Often the widescreen version cuts his chin off, or the top of his head. Jan's poem is beautiful ~ I love this! Thank you for the links too. How wonderful to hear J.R.R Tolkien speaking in the language he created, and the lady singing (to her own melody) 'Galadriel's Song' appears extremely competent in her pronunciation. Thank you, Mechtild and Jan.
You're welcome, Blossom. I'll have to tell Jan you not only liked the poem but opened the links. Didn't she link some great things? Your screencaps are to die for, but it would be great to see what you'd do with fullscreen caps. What region is the U.K.? Does Region 1 play there? Jan's links were well worth clicking on, Mechtild. The only one I didn't take a look at was tuckborough.net, but I do intend to follow it up ~ The Thain's Book sounds interesting. As for the Region 1 DVDs: Multi-region DVD players are available here in the UK, but I don't have one, and unless I win the lottery (very unlikely as I don't buy a ticket! ), I won't be getting one anytime soon. So, I must make do with the widescreen versions of the films for the time being. However, I'm not totally deprived of fullscreen Frodo, as I do have folders full of your lovely screencaps from your LJ entries stored for posterity on my external hard drive. Hope you don't mind ~ I can't resist right-clicking and saving them. The Thain's Book is a pretty good, easy, fast LotR reference. I often look things up in it. Just browse it whenever you want to check something quickly - names, dates, places, objects, etc. Well, if you had the player for it, I'd try to get you fullscreen copies, Blossom. They used to be really cheap here; I got mine each for less than ten dollars new, having bought them after the films were all out, for making screencap portraits. They may be harder to find by now since most buyers want widescreen, of course, especially now that all new TV's have a more rectangular shape. It's interesting to think that it wasn't that many years ago, when almost everyone still had a TV set with a picture tube (we still do), thus with a nearly square picture screen. I rarely go to someone's house now that they haven't got a new flat panel TV. No wonder no one buys fullscreen. I bet they don't even make them anymore, since the screens they were made to fit are no longer made. We don't have a flat-panel TV either. Ours is widescreen, but it has a blooming great big rear end that virtually fills the corner of the room! That's such a kind thought, Mechtild ~ thank you ~ but I think you're right in assuming that the fullscreen DVDs are harder to come by now, as out of curiosity I checked on Amazon.co.uk, and found only one boxed set of the trilogy available in fullscreen. It was Region 1, and rather pricey to boot! I'm not really looking to purchase the films again just yet anyway ~ I have them all three times over as it is! Many thanks Mechtild, Jan-u-wine and Blossom for this wonderful post!! Seeing the tears in Frodo's eyes in a couple of the caps reminds me of Elijah's comments on the dvd commentary for this scene. He said that PJ had asked him to produce a tear and try as he might it just wouldn't come - he described how awful he felt in front of Cate, who waited patiently. But from these pics I'd say he was putting himself down a little too much - there's definitely tears there - and I don't think he had any 'help' because when Dom said, "Time for the tear stick!" Elijah said, "No". Paulie, thanks fo much for relating this annecdote here. You know, I've heard of the scene in which he was blocked for some reason and couldn't produce the required tears. I hadn't known it was this one. Isn't Dom the wickedest thing. That sort of light-hearted teasing might have made Elijah gird his loins, but I'll bet it also made him smile, maybe even relax a little, so that the emotional release would be easier to let happen. If anyone would know, you would! and if you do not find a way, no one will. 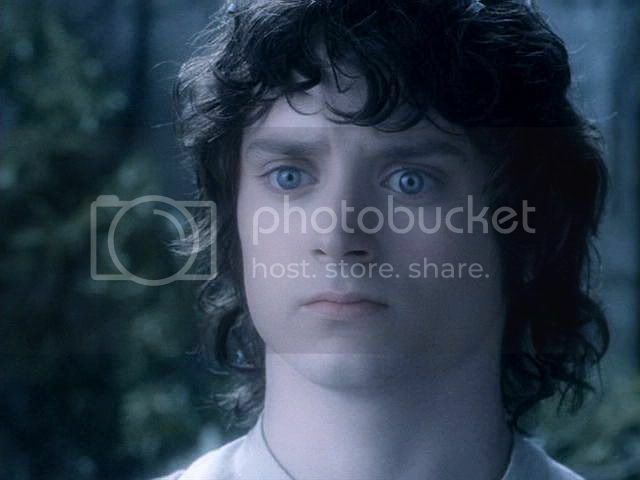 I LOVE Frodo's sweet little determined face. And also for the links: it's at treat to hear Galadriel's lament read by Tolkien!